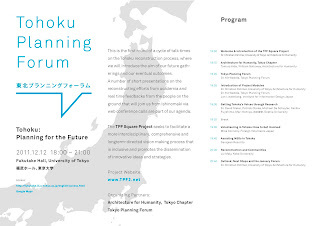 Minato City will hold the annual “Minato International Dialogue” on January 28th, 2012. The theme is “Creating A Community Well-Prepared Against Disaster - where foreign people and Japanese support each other.” Discussions at the event will be carried out in a style called “World Cafe.” English and Japanese interpretation is available. Date and time Saturday, Jan. 28, 2 p.m. to 4 p.m. Application Please call or fax with the information as below. - Phone: “Minato Call” at 03-5472-3710 from 9 a.m. to 5 p.m.
A network of eldercare facilities in Iwate and Miyagi Prefectues provided recipes for Comfort Food favorites of the region, and a team of committed volunteers have created a very special book called Tohoku Comfort Food. Please take a look at the attached flyer and I hope you or your organization may consider a pre-order of one (or maybe several) book(s) to help the cause! Tohoku%20Comfort%20Food%20Order1.pdf Proceeds go to community recovery projects in Tohoku. Nuclear Power Free World in Yokohama, Japan on January 14-15, 2012. • This conference will create a venue for people from all around the world to gather in Japan and respond to the reality of Fukushima. Hibakusha”. We will learn from each other's experiences to illustrate the human and environmental consequences of the nuclear chain. • The conference will also aim to demonstrate that it is realistically possible to create a society that is not dependent on nuclear power. interesting article - what is your take? obvious or in need of UN support for legitimacy? 5 December 2011 – Stressing that volunteerism contributes to the well-being of individuals, communities and society, a new United Nations report released today urges countries not to forget this largely untapped asset.